Turns out having three kids is harder than having two kids. Last week someone asked me how I was handling transitioning to three kids and I emphatically told them that I was doing great and that it was much easier than I expected it to be. with bonus points if that one person isn't me". That pretty much sums my life up. I know things will get better once we all get back into some sort of schedule, but until then I am going to try really hard to remember that having three kids under the age of four (until next week that is) is a challenge and that as long as everyone is fed, bathed, has clean pants, and no one is bleeding I can consider the day a success! 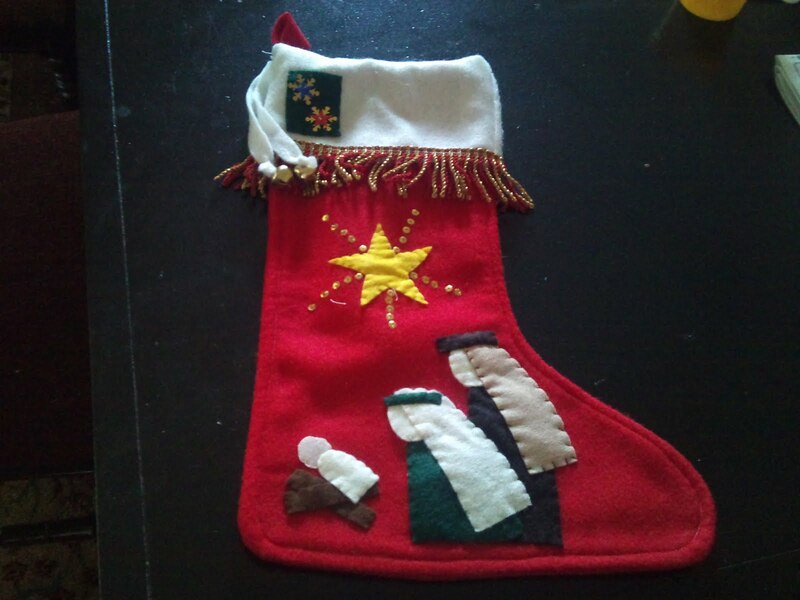 I want to share Abe's Christmas stocking because I am pretty proud of how it turned out. I actually finished it before he was born and now just need to embroider his name on it. I've made similar looking stockings for my other kids (Asher's has a dove on it and Rose's has an angel) but I think this nativity scene is my favorite out of all of them! Did you get a chance to watch the First Presidency Christmas Devotional? Elder Eyring shared some of the videos that the church has produced about the life of Christ. These videos are beautifully done and so powerful in their simplicity. I love the one they made of Elizabeth greeting Mary, it is such a sweet portrayal of a scene, which in my opinion, doesn't get shared enough. What truly remarkable women these two women were! I hope you will take the time to watch these videos and to share them with your friends they are a wonderful way to commemorate the birth of our Savior. 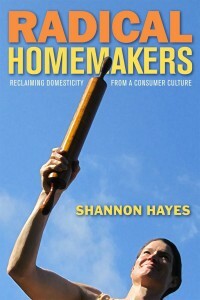 I've been reading "Radical Homemakers" by Shannon Hayes and am really enjoying it. Reading it has been so validating because the whole book is pretty much explaining (much better than I ever could) what I was trying to say in my "This is the Type of 'Feminist' I Am" post. What I call "family feminism" in my post she calls "radical homemaking", and while she takes a more of a ecological approach than a feminist approach she is really saying almost the exact same thing as me-- except with lots of good research to back it up. I would LOVE to have a online "book club" discussion about this book if there is anyone interested. What if I gave you a couple months to read it and then we could discuss it more on my blog? Any takers? If you need something more to get you excited to read this book check out this book review. 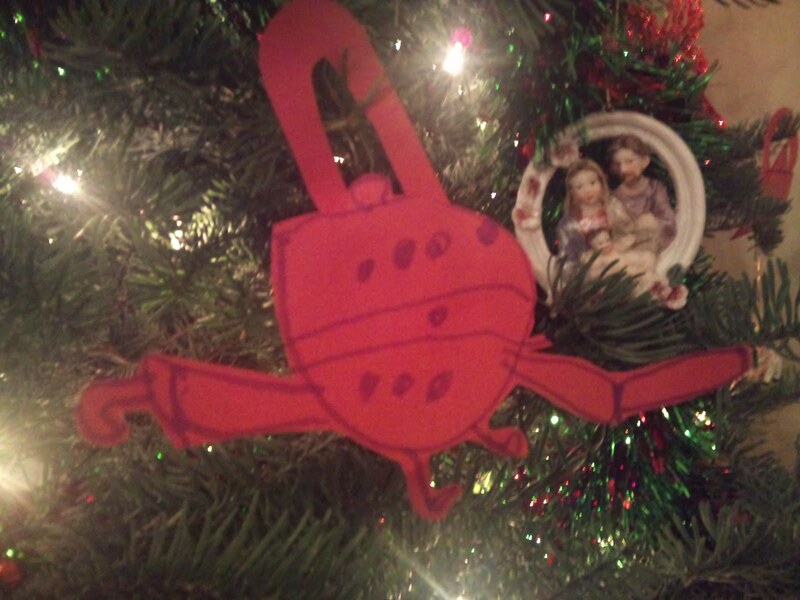 complete with a hook and a sword. Crazy boy. Wishing you all a Merry Christmas and a great weekend! I found jumping from two to three children incredibly hard! I always joked the math did not add up...one extra child does not equal one extra set of jobs or work. Instead it equaled 10x the work! My youngest is 6 and life has been fairly easy for a while, but in the beginning...sheesh! Would love to do an online book club - the book sounds fascinating. Can't wait to read it! The hardest children to add for me were #2 and #3, for different reasons. #2 came when my oldest was 3.5, she could use the bathroom, feed and dress herself, and all of a sudden I was back to doing absolutely everything for someone. Then #3 was born with # 2 just turning 13 months old and still a baby himself. Exhausting. The good news is that babies 4, 5, and 6 were a piece of cake. #7 will be here soon, I suspect some difficult adjustments because of his medical issues, but hopefully not too much. My husband and I have started incorporating these practices into our family as we could. I was glad that he read Equally Shared Parenting with me (it was kind of a toss of which one I was going to recommend and I figured the more pragmatic, this is how its done might be more appreciated). We are looking forward to a time when we can incorporate more equality into our duties and we're looking for those opportunities. Right now we're hanging on through the last few months of his PhD. If only I could convince him to take one day off a week, I'd feel like we had made a big step. A dove! A dove! Thanks for the idea. Our kids' stockings have a baby Jesus in a manger, an angel, and a sheep. Now with #4 coming I thought, a cow? No. A donkey? No. A stable? No. Wise men? Well... All the stockings have stars; ours have Christmas trees and stars. The dove is perfect, unless you have any other ideas for me! And, I haven't heard of that radical homemaker book. I'll totally have to check it out. Thanks! Does the library have it or did you have to purchase it? Jenne - read your review. Very interesting. I also really liked reading the comments. I definitely WILL check this out! Just found a lot of the book on google books: http://books.google.com/books?printsec=frontcover&id=Wq_8EESvDdUC#v=onepage&q&f=false. MIght be all the book, but it hasn't all loaded yet. Love that stocking, you're amazing! I absolutely agree with you about e being hard. I found that child 1 and having child 3 was very hard for me. The first one because you're new at the whole being a mother thing. With 3 your outnumbered! Not enough hands to do things! I remember having to chase my 2 1/2 year old in the parking lot while keeping tabs on the 5 year old and holding a newborn. Now that I have 4 it's easy. The oldest are very helpful. and Carin, THANK YOU. You nailed it right on the head. The biggest problem really is learning to let go of my agenda. The days actually go really well if I just do what the kids want to do but as soon as I want to have some me time or check my email thigns fall apart. I am trying to figure out how to manage this because without "me" time I am having a hard time handling things. I just need to have a paradigm shift (like me time is now night time instead of nap time) and then I'll probably be fine! I really like that quote! Three was hard in the beginning but not nearly has hard as two was. Four was hard but better since our oldest was 6 and more helpful. Good luck, you will get through the hard days! !